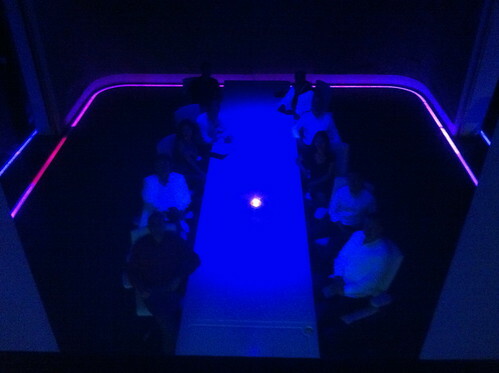 Ultraviolet by Paul Pairet – an amazing dining experience! 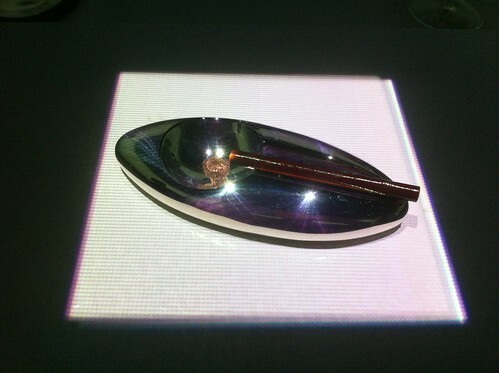 A couple of weeks ago I heard that Paul Pairet would open a new restaurant in Shanghai, a place that would offer a never-seen-before dining experience. The name? Ultraviolet. 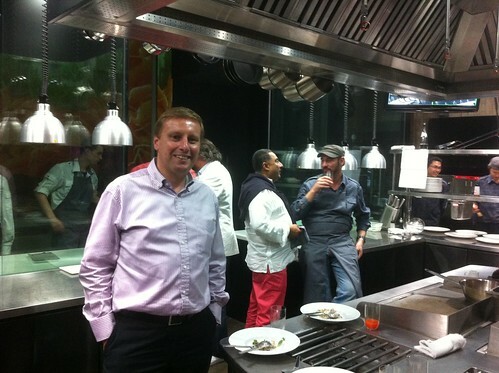 I have been following Paul’s cooking skills since he was the chef at Jade on 36 and later at Mr. & Mrs. Bund. Over the years I had many dinners at his restaurants and the experience and the food was always great. 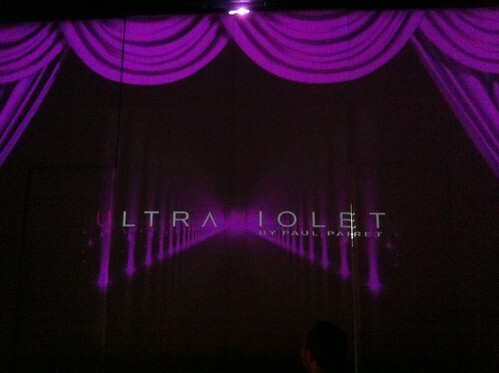 Therefore I decided to visit Ultraviolet as soon as it would open and that was a decision I do not regret! 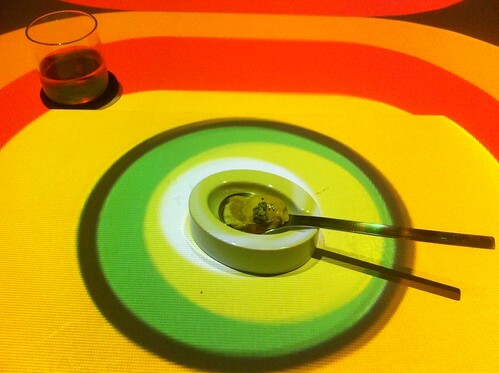 Ultraviolet is different from any other restaurant you have ever been to. First of all you don’t know where the restaurant is. 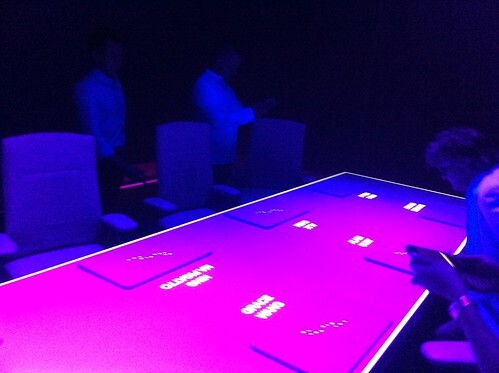 You get an aperitif at Mr. & Mrs. Bund and are then transported to the semi-secret Ultraviolet location. Second, you will be having dinner at a big table for 10 people, people you may have likely never met before. Third, you can’t choose what to eat, but you have to follow what the kitchen will serve you. Fourth, it’s not a simple 2 or 3 course dinner, but a 22 (yes, that’s twenty two) course culinary experience that can’t be compared to anything else I have ever seen. I could continue this list, because Ultraviolet is incomparable to any other place – not only in Shanghai, but possibly worldwide. 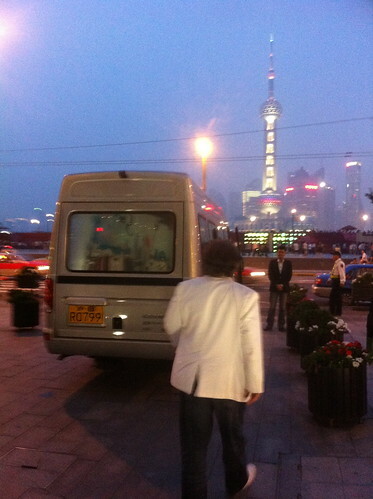 We arrived at Mr. & Mrs. Bund around 6:45, and most of the other guests were already there. Fabien Verdier, our host of the evening and director of the dining experience, received us with a glass of pear cider and explained a bit about the evening. 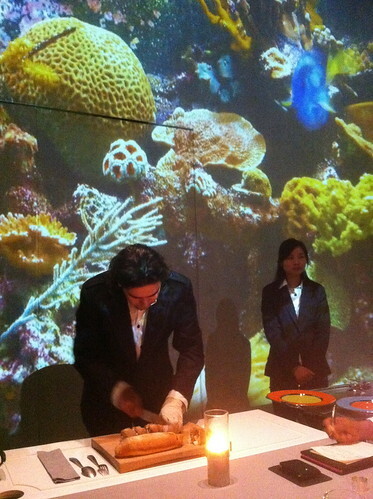 He gave all the guests a copy of the 22-course menu for the night, a list with names on it like “Pop Rock Oyster”, “Cucumber Lollipop”, “No Shark Fin Soup” or even “Hibernatus Gummies”. Every course had a drink pairing (mainly wines, but also beer, sherry and some teas), so don’t drive yourself if you plan to have dinner here! I won’t give a detailed experience of the whole evening, that may spoil it for people who want to be surprised and just want to have a fantastic experience. Next to that it’s almost impossible to describe what you will see, hear, feel, smell and taste during the night – it’s an experience that you have to be part of yourself. From Mr. & Mrs. Bund we were transported by van to the Ultraviolet location, which turned out to be very close to one of my offices (I won’t say which one), so I actually knew the building already. We were led to the entrance and all had to wait at a steel door. Suddenly the door opened and we entered a steel cage, while the door closed behind us. Everybody looked at each other, nobody had a clue what was going to happen. I won’t describe that here either, but it was a great start of the evening to enter a restaurant like this. A few minutes later we entered the dining room, a big darkened room with a huge table with 10 seats around it. The table itself turned out to be a big computer display that had our names projected next to the chairs where we were supposed to sit. We were told that anybody who wanted to use the rest room would better do it now, because the show was ready to start and you would not want to miss part of it. Suddenly the room was transformed into a courtyard with the walls covered with green leaves, all through 360 degree projections. With loud music coming from the sound system the room suddenly seemed to turn into an elevator and we were going down and down and down – until we ended up in space! Then 10 waiters came in and brought the guests their first course. 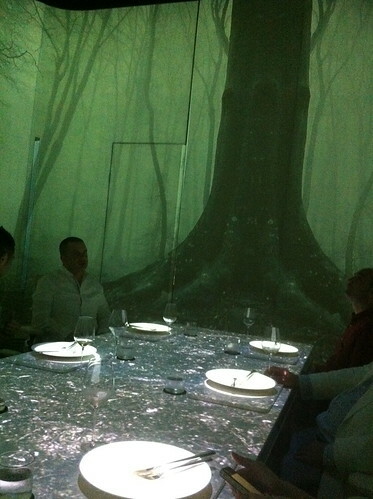 The dish was titled “Ostie”, a combination of apple and wasabi, with Gothic Church Bells playing in the background. A great combination to start the culinary journey. 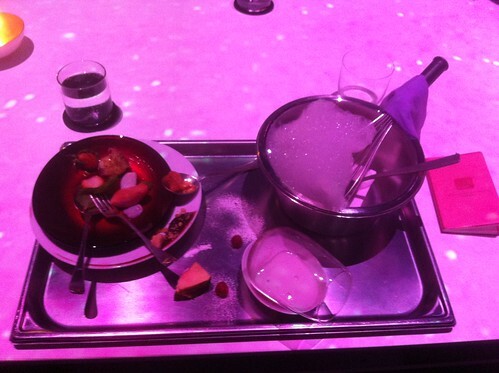 During the next couple of hours we did not change our seats, but the setting changed with every dish. 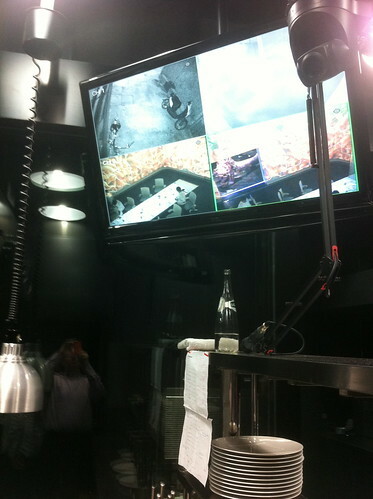 Different video projections and audio feeds, all somehow linked to the dish that was being served. For example for the Micro Fish No Chips, it seemed to be raining. The walls showed the rain falling and the sound systems played the sound of heavy rain. 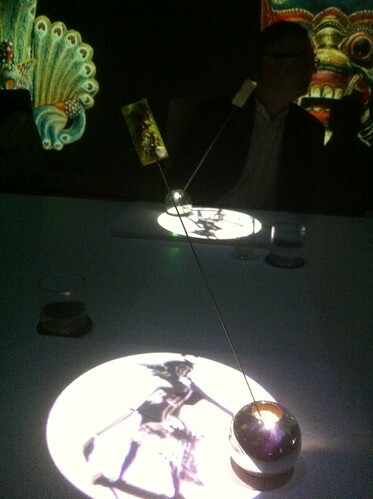 The table transformed into a projection of the English flag. It all fit together so well, and it made each and every dish a special experience. We had restaurant settings among the fish in the sea, on a bridge in Paris, with the view from Mr. & Mrs. Bund, but also waves on the rocks at the seaside and for a Greek dish sceneries from Greece. Every scene was accompanied by special music that was related to the dish. The food was of course superb, or as Alain Ducasse (who had been the first guest before the venue opened officially) wrote on the wall of fame: magnifique! Several of the dishes I had before in either Jade on 36 or Mr. & Mrs. Bund, but the setting is so much different that it’s a whole different experience eating them here. Paul Pairet is a magician with food, he is able to make combinations that you could never think of yourself and prepare them with his state-of-the-art kitchen equipment. Halfway the dinner we had a short break in the winter garden, where people could have a smoke – but none of the guests smoked. It was also nice to talk to some of the other dinner participants. It turned out that many of them were in the F&B business themselves. For example, the guy sitting next to me was the Chef de Cuisine at the Waldorf-Astoria Hotel, and the couple sitting opposite us were both working for Starwood (one of them was a former chef in several Starwood hotels). There was someone from Club Med, and there was even a writer who was writing a book about the world’s top restaurants (I think, I just caught some things he was telling other guests). An interesting group of people for sure. Paul Pairet is among the very best chefs in the world, and he is willing to take risks with his food and with his restaurant concept. Ultraviolet is his life’s work: he spent the past 15 years working on this concept and the past 3 years building it! If you think about it, working for 15 years to realize your dream and then doing it in Shanghai, that is just plain amazing. He is a real entrepreneur, someone who believes in his concept and finds a way to make it work. And that is not easy, because from what I understand he makes a big loss on a per person basis. 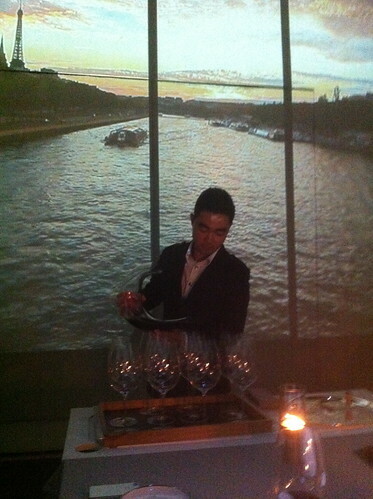 You pay RMB 2000 per person for the dinner, but the costs are more in the order or RMB 5000 per person. He has sponsors who cover part of this costs, but he also has other ideas to be able to earn back the money. And I think he will succeed: Ultraviolet will bring Paul Pairet even more fame. 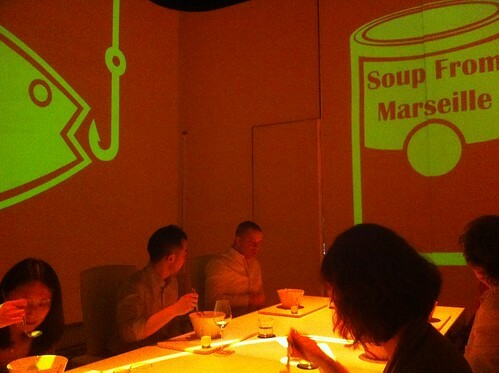 I think this is a restaurant that people may travel to Shanghai for, just to try it out. 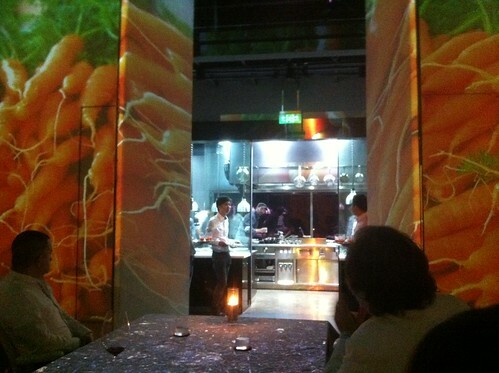 It’s the combination of the show (the meal is a big show with 25 people working on the stage and behind the scenes), the decor and the amazing food. 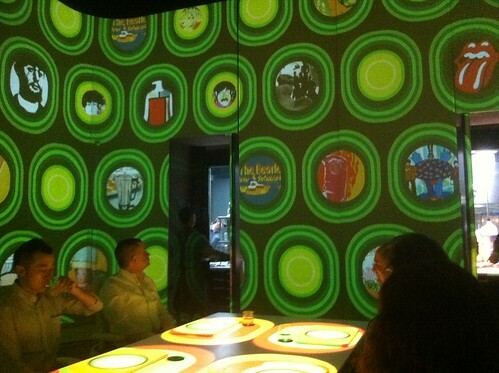 Everything just fits together, while using the latest technology both inside and outside the kitchen. This may actually become one of those top restaurants that people just must have been to once in their life. For me it was an incredible food experience. It’s hard to describe in words, but look at the pictures and imagine the food – and then make a reservation as soon as possible. Don’t go here on a date or a romantic dinner (although you will impress your date! ), but go here for the food and the experience. The place is now already fully booked for the next couple of weeks, and I am afraid that very soon you’ll have to make reservations months in advance. But just do it, I can almost guarantee you that you won’t regret it. 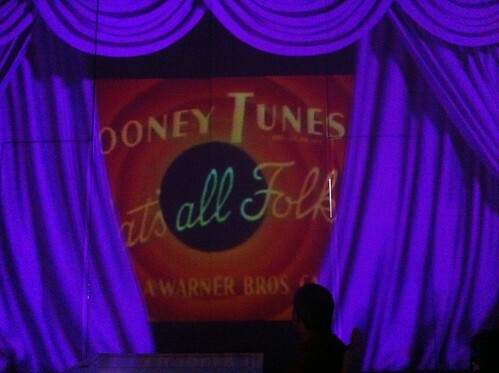 For more pictures of the Ultraviolet experience see this set on Flickr. For reservations go to http://uvbypp.cc/bookings/ . The evening starts between 6:30 and 7 PM at Mr. & Mrs. Bund and the dinner will be finished around 11:30 PM. Made my reservation to go there with my wife for our wedding anniversary but I have to wait until August! You really start to find amazing restaurants in Shanghai compared to 5-10 years. When I arrive to Shanghai in 1997, you could only find decent coffee in 5-star hotels. Shanghai came a long way! WILL WE BE BACK: Yes absolutely definatley it would be the reason for going back to Shanghai – I want to book the whole table and have just my friends – with no cameras maybe even a race. We were fortunate to meet “Paul Pariet” the genius himself, his creations left nothing to chance. Our wishes were fulfilled even before we made them. I danced in the bar during the break and laughed with delight. You should open your wallet pay the whole thing in advance and enjoy. ONE DISAPPOINTMENT: Fellow diners were all stranger to us and they stayed on their iphones all night taking photos, movies, and paying games! I didn’t understand why. We have amazing memories of the night.